Guests can get ready for a new way to “wave” goodbye to work and school and say hello to their Disney cruise vacation with Mickey’s Sail-a-Wave Party on the Disney Wonder and Disney Magic! This high-energy countdown event on embarkation day features characters, dancing and a show-stopping performance – giving you an unforgettable way to start their cruise. On a Disney cruise, you don’t even have to wait until the horn blows to get the party started! You can join Mickey, Minnie, Goofy, Pluto and Donald on the top decks for this fun-filled celebration. 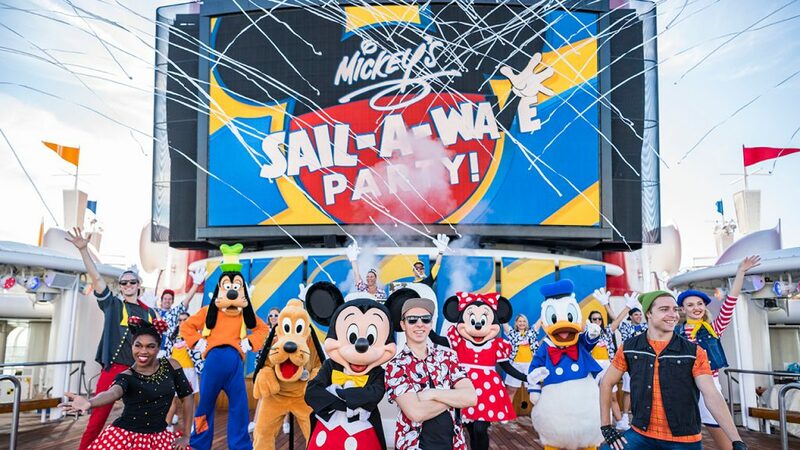 Dance alongside the crew and characters, and participate in the biggest “wave” on the high seas before the official sail-away countdown signifies the start of their vacation! And here is how you can get in on the action of Mickey’s Sail-a-Wave Party before they ever leave home. Be sure to order your own Mickey mitts ahead of time and plan the perfect sail-away outfit inspired by your favorite Disney character, because there is a moment in the show where cruisers get to walk the run-WAVE to show off the best themed outfits! Mickey’s Sail-a-Wave Party is already making waves aboard the Disney Wonder and will premiere on the Disney Magic on Feb. 22, 2019. Are your Clients sailing on one of these two ships soon? Be sure to tell them to pack their Mickey mitts, and their best character-themed attire so they can start their next cruise in style!